Heeft u een vraag voor Goodstay Hotel Daewoo Inn? Tijdens uw bezoek aan Seoel zult u zich snel thuisvoelen in Goodstay Hotel Daewoo Inn, dankzij de hoge kwaliteit en de goede service. Slechts 0.1km verwijderd van het stadscentrum, is dit een goede plek voor gasten om te genieten van de attracties en activiteiten in de stad. Voor mensen die er op uit willen gaan, Seoul Stadhuis Plaza, Ambassade van Dominicaanse Republiek, Myeong-dong zijn slechts enkele van de attracties die beschikbaar zijn voor gasten. Eersteklas services en voorzieningen zijn het handelsmerk van Goodstay Hotel en worden ook u geboden in het Goodstay Hotel Daewoo Inn. De topvoorzieningen van de accommodatie zijn inclusief gratis wi-fi in alle kamers, dagelijkse schoonmaak, bagageopslag, wi-fi in openbare ruimtes, familiekamer. 20 kamers, verspreid over 5 verdiepingen, bieden een warme en plezierige atmosfeer. Enkele kamers zijn voorzien van voorzieningen zoals plasma tv, internet (draadloos), draadloos internet (gratis), rookvrije kamers, airconditioning. De accommodatie biedt talrijke recreatieve mogelijkheden, zodat u voldoende te doen heeft tijdens uw verblijf . Wat de reden van uw bezoek ook is, Goodstay Hotel Daewoo Inn is een uitstekende keuze voor uw verblijf in Seoel. Nearest City Hall Subway Station, take exit 7 and its around 330 meters away. Its perfectly good for budget travellers who does not have high expectations with reasonable price. About 7 mins walk to main Myeongdong night market. 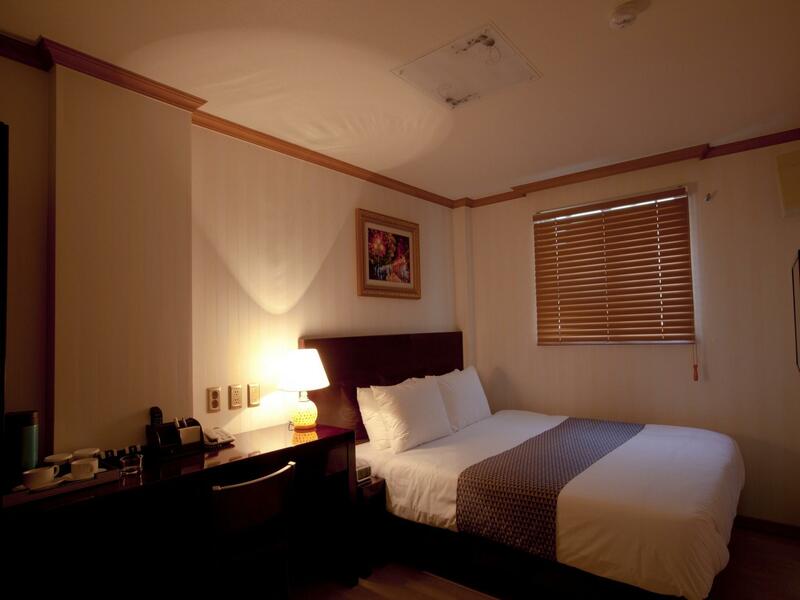 Location is in the central of the city, Very good, its near to Namdaemun, Myeongdong, Gyeongbokgung, Seoul Station. Near to train station too , takes about 10 minutes walking. the Suggestion only the bed , quite hard. Great location ! A few minutes walk away from City Hall subway station and a short walk to some really good tourist destinations. There's an airport bus stop nearby too. The staff were very helpful and friendly and quite good with English. There are numerous good and cheap local restaurants around the area. A few improvements would make this even better. There were no hooks provided in the room so jackets were strewn all over the place (we came in autumn). There was no full length mirror provided in the room or hallway so hard to check clothes. No bedside lamp in some rooms. No handrail going to the basement kitchen for breakfast so a bit hard for seniors. Those are little things that can easily be fixed, so despite these you can't really go wrong staying here as a tourist who will be out sightseeing most of the day. Delicious breakfast freshly prepared in the morning, different menu every day! Inn manager was very friendly and speaks English well. We stayed 3 nights and looked forward to the delicious breakfast freshly prepared by the aunties in the morning. The menu was different every day, and definitely beat more expensive hotels that give same buffet good everyday! The Inn manager was very friendly and speaks English well. He would advise on places to visit and drew the locations on the map so they were easy to find. The inn was clean except that my children had a room on first floor, just next to the check-in counter, so it was little privacy for them. The air-con in their room also automatically switched off every 5 minutes, which was frustrating as the room can get quite warm even in winter. Room is a bit small, but for the price, it's value for money. Location was 10 mins walk from City Hall station so it's convenient to move around. Many eating places around the Inn too. The owners and staff are very accommodating, the food served every morning are yummy authentic korean and oriental dishes, The room is warm and clean. It was a very relaxing and homey stay. I'm very happy we were able to find this from agoda and we stayed here because it's just few minutes from top locations such as meyongdong shopping district, donfaemun, namdaemun, palaces etc. it's also just 3 mins. away from the train station. Have stayed at this property several times over the past two years. Breakfast went from a great spread to a piece of toast and coffee. Horrible breakfast! The hotel has been neglected. Towels are completely worn out for example. There is mold in the bathroom. The price increased while the services declined. This is no longer a good value for your buck. Stay elsewhere. Small place but clean. We went during winter and our room was nice and warm. Very convenient location. The staff was nice and let us keep our luggage in their luggage storage area even after we had checked out. A bit disappointing, but I shouldn't be considering the price. For the price and excellent location, I'd say it's worth it. But it's simply not the nicest place. So it all depends on what you prioritize. I wouldn't come here again, but I wouldn't refrain anyone else to go either. I really love staying in Goodstay Hotel Daewoo Inn. Its my 4th time to stay and I will never choose (unless its fully booked) other than this hotel. I love that all main tourist destinations are walkable from the hotel - walk to Myeongdong, Namdaenum, Gyeongbokgong Palace, Insadong, etc! It's also at the City Hall station wherein the green line passes through which will take you to the university areas where it is cheaper and lots of shops to explore! Location close to metro and shopping area of Seoul . Room size is comfortable with the fare is reasonable . Included breakfast and close to plaza hotel for airport coach service just across the street . I have stayed in this hotel many times and its quality is still good: good staff, central location, and very clean. My only disappointment is the quality of the breakfast seems to have dropped. One of the main reasons for me to stay here is because of its breakfast. There used to be a lot of different dishes available but this time the choice seems to have reduced and there was no fresh fruit. I have to say it is still better than most other small size hotels offered but when I compare it with its past, there seems to be a change, probably due to cost I believe. I am writing this not as a complaint but more for the management of the hotel. I am still recommending this hotel to anyone looking for a clean and central place with a budget. 1. Location is 5 minutes away from metro station. 2. Lots of restaurants and pubs around. 3. Quiet room even though there are pubs around. 4. Clean room However, we were given the wrong room because hotel overlooked on our order. We have to change to another room the next day. Stayed for 7 nights. Good location. 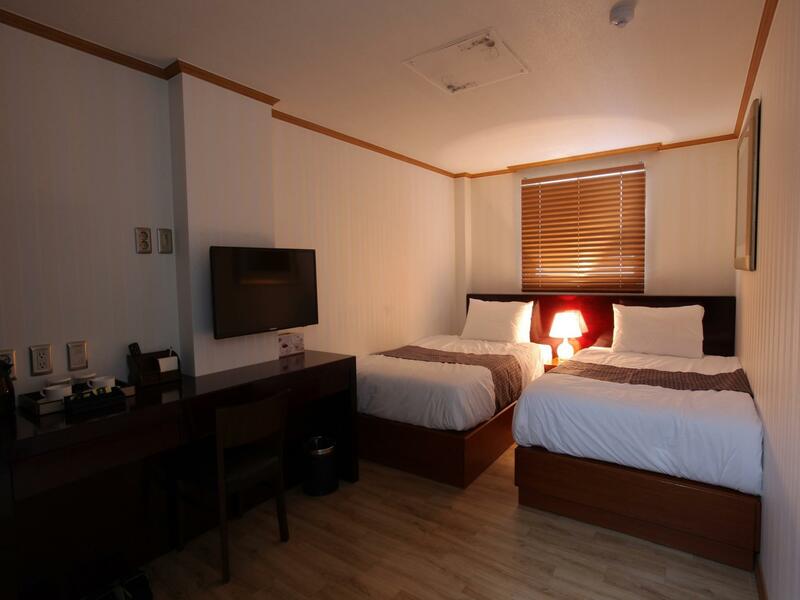 Near to City Hall Metro and walking distance to Myeongdong and Namdaemun. If you are taking line 2 metro exit 8 to reach hotel, there is no lift. You will need to carry your luggage up the flights of stairs. If you are taking airport limo to reach, the airport bus (at Plaza hotel) stop is nearby. Bed sheet was clean but some towels did have some stains. Limited choices for breakfast. Generally, it is good enough hotel for the amount of money paid. I have enjoyed my moments at Goodstay Hotel. The place is ideal for travelers who aim to explore the city because of its strategic location...within the shopping area, few walks away from popular tourist spots, and close to subway station. I did not felt the warm help and assistance of the staff. Pretty good location. Staff were very helpful and allow me to check in early. A lot of wonderful eateries around the hotel. It's a nice hotel but the room is small so very to get comfortable. The breakfast was simple but good. The best thing about the hotel is the location and it's a good place to stay around City Hall also a lot of good food around. Near to all of the places of interest, comfort of staying, Very good breakfast. Everything is very good. 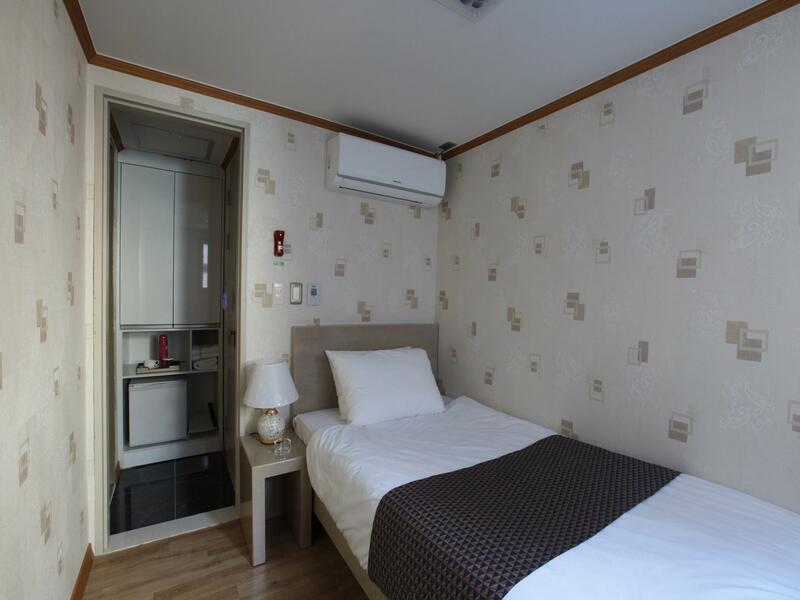 From the accommodation, the comfort of staying, very nice owner and staff, walking distance to all places of interest, subways, and seoul train station, and shopping centers. Its like its in the center of Seoul. 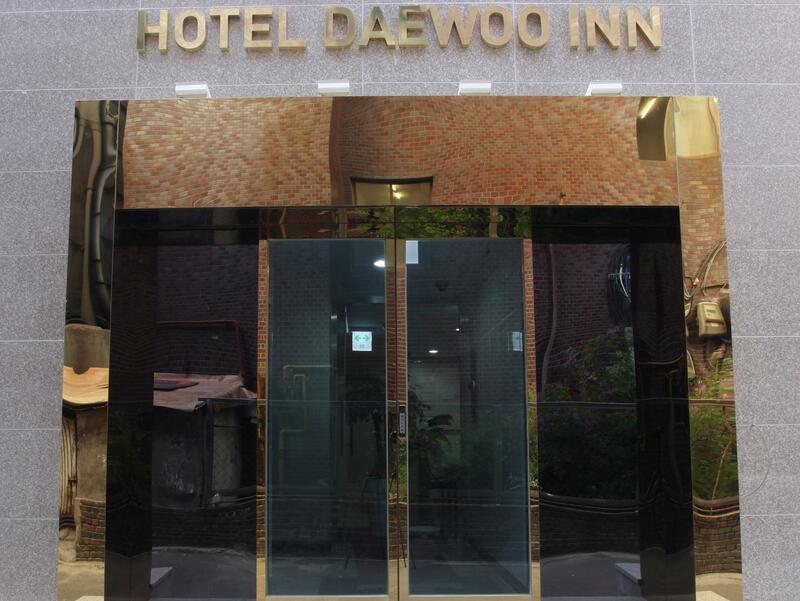 I would absolutely to stay here again in Goodstay Hotel Daewoo Inn and will also recommend this place to other travellers. Good and wide variety of food for the free breakfast, Very nice and accomodating hotel personnel, Very nice location. We had a very good stay and experience in this hotel (I would change the name from "Goodstay"Hotel Daewoo Inn to "Very Goodstay" Daewoo Inn) All the hotel people we're nice especially Mr. Kim ( I think he's the owner ) he's been very helpful, same goes with the other hotel staff who we think is also family, they always make sure that we enjoyed our breakfast every morning. Though we had a lil hard time finding the hotel the first time, The location is very strategic since it's very near to the shopping areas, restaurants and transport stations (Buses, Subway, Cabs). You can also walk going to Myeongdong Cathedral (For Catholics this is very fine), lots of money changer around the area. Given the chance to return to Seoul, would definitely stay there again. Thanks again to Mr. Kim and all of you there, you made our stay extra special.